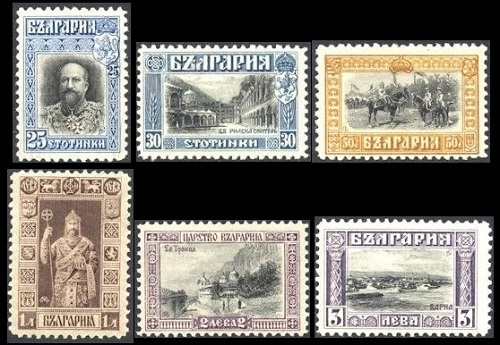 The first pictorial definitive Bulgarian stamps appeared in 1911, and from that point forward, almost all the definitive stamps of Bulgaria have been large-format pictorial or portrait stamps. The period between 1911 and 1928 would also witness the unexpected departure of one monarch and the ascension of another monarch. 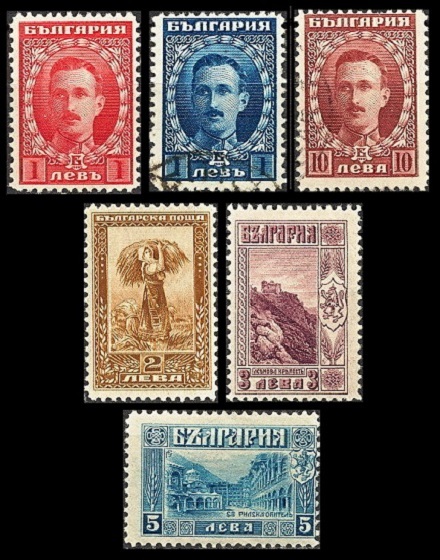 The twelve major-type pictorial and portrait definitive Bulgarian stamps shown above were issued between 1911 and 1915. Their designs are as follows. 30 S. - Rila Monastery. This 10th Century monastery, founded by Ivan of Rila (876-946), is the largest Eastern Orthodox monastery in Bulgaria, and it is still in use today. 50 S. - Tsar Ferdinand and his sons. 01 L. - Tsar Ferdinand in the robes of the ancient tsars. 02 L. - Monastery of the Holy Trinity. This Eastern Orthodox monastery, near the town of Veliko Tarnovo, was constructed during the Middle Ages. 03 L. - View of Varna. This Black Sea seaport, originally called Odessos, was founded almost 3,000 years ago by the Thracians. It is believed that the area was settled far earlier than that though, as gold jewelry, dating back to 4,600 B.C. has been found there. The Scott catalog attributes, for stamps that are engraved and perforated 12, are as follows. 01 S. (1911 - Sc. #89) - Myrtle Green. 02 S. (1911 - Sc. #90) - Carmine & Black. 03 S. (1911 - Sc. #91) - Lake & Black. 05 S. (1911 - Sc. #92) - Green & Black. 10 S. (1911 - Sc. #93) - Deep Red & Black. 15 S. (1911 - Sc. #94) - Brown Bister. 25 S. (1911 - Sc. #95) - Ultramarine & Black. 30 S. (1911 - Sc. #96) - Blue & Black. 50 S. (1911 - Sc. #97) - Ocher & Black. 01 L. (1911 - Sc. #98) - Chocolate. 02 L. (1911 - Sc. #99) - Dull Purple & Black. 03 L. (1911 - Sc. #100) - Blue Violet & Black. The Scott catalog attributes, for stamps that are re-engraved and perforated 11 1/2 or perforated 14, are as follows. 01 S. (1915 - Sc. #114) - Dark Blue Green. 05 S. (1915 - Sc. #115) - Green & Brown Violet. 10 S. (1915 - Sc. #116) - Red Brown & Brownish Black. 15 S. (1915 - Sc. #117) - Olive Green. 25 S. (1915 - Sc. #118) - Indigo & Black. 30 S. (1915 - Sc. #119) - Olive Green & Red Brown. 01 L. (1915 - Sc. #120) - Dark Brown. 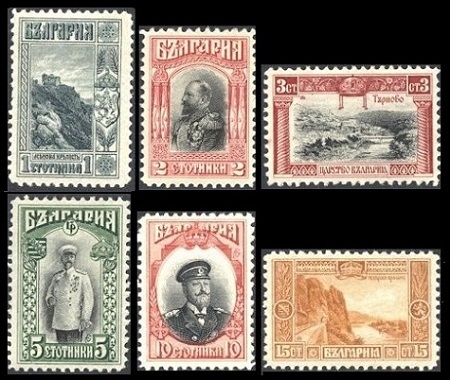 The thirteen major-type pictorial and portrait definitive Bulgarian stamps shown above were issued between 1921 and 1923. 10 S. - View of Sofia. 20 S. - Monument to Alexander II in Sofia. Known as the "Liberator", Tsar Alexander II of Russia (Lived: 1818-1881, Reigned: 1855-1881) liberated Bulgaria from Ottoman rule during the Russo-Turkish War of 1877-1878. 25 S. - Tsar Boris III. 50 S. - View of Trnovo. 75 S. - Monastery at Shipka Pass. The Shipka Memorial Church is a 19th Century Bulgarian Orthodox church. 01 L. - Tsar Boris III. 02 L. - Harvesting grain. 03 L. - Tsar Assen's Tower. 05 L. - Rila Monastery. 10 L. - Tsar Boris III. 10 S. (1921 - Sc. #158) - Blue Gray. 20 S. (1921 - Sc. #159) - Deep Green. 25 S. (1922 - Sc. #160) - Blue Green. 50 S. (1921 - Sc. #161) - Orange. 50 S. (1923 - Sc. #162) - Dark Blue. 75 S. (1921 - Sc. #163) - Dull Violet. 75 S. (1923 - Sc. #164) - Deep Blue. 01 L. (1921 - Sc. #165) - Carmine. 01 L. (1922 - Sc. #166) - Deep Blue. 02 L. (1921 - Sc. #167) - Brown. 03 L. (1921 - Sc. #168) - Brown Violet. 05 L. (1921 - Sc. #169) - Light Blue. 10 L. (1921 - Sc. #170) - Violet Brown. 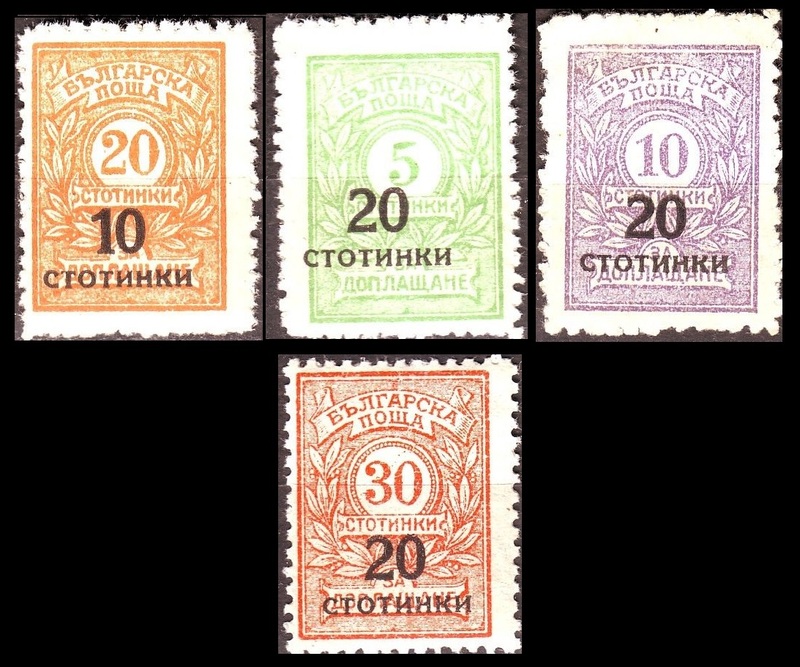 The four Bulgarian postage due stamps shown above were overprinted and re-valued during 1924. 10 S. on 20 S. (1924 - Sc. #182) - Salmon, Yellow. 20 S. on 05 S. (1924 - Sc. #183) - Gray Green, Emerald. 20 S. on 10 S. (1924 - Sc. #184) - Violet. 20 S. on 30 S. (1924 - Sc. #185) - Orange, Red Orange. 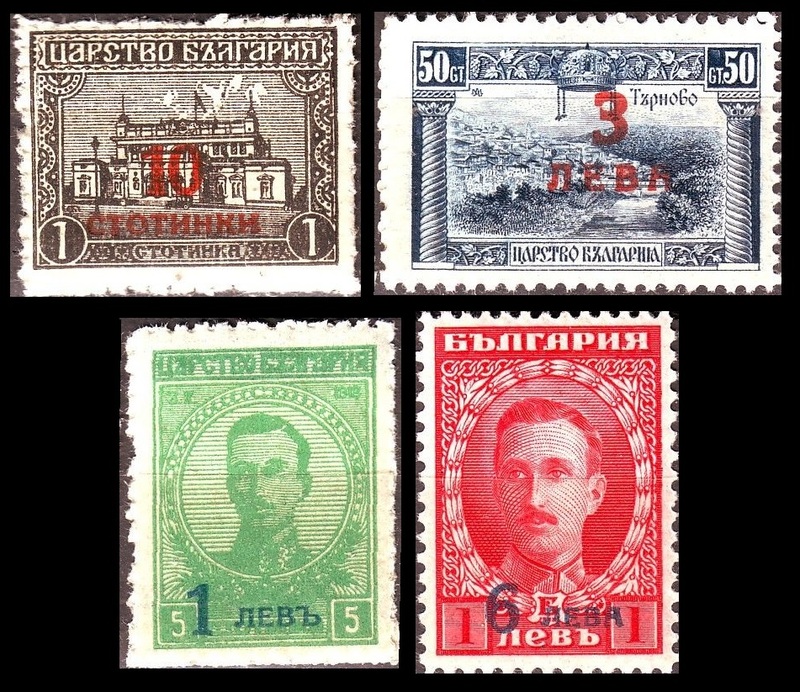 The four pictorial and portrait definitive Bulgarian stamps shown above were overprinted and re-valued during 1924. 10 S. on 01 S. (1924 - Sc. #186) - Black. 01 L. on 05 S. (1924 - Sc. #187) - Emerald. 03 L. on 50 S. (1924 - Sc. #188) - Dark Blue. 06 L. on 01 L. (1924 - Sc. #189) - Carmine. 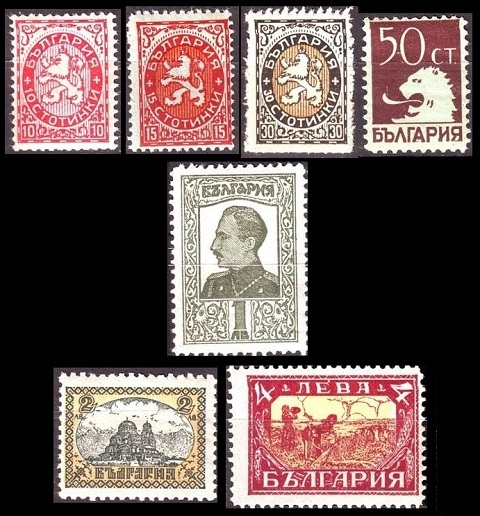 The seven heraldic, pictorial, and portrait definitive Bulgarian stamps shown above were issued in 1925. 10 S. - Lion of Bulgaria. 15 S. - Lion of Bulgaria. 30 S. - Lion of Bulgaria. 50 S. - Lion of Bulgaria. 02 L. - New Sofia Cathedral. 10 S. (1925 - Sc. #191) - Red & Blue. 15 S. (1925 - Sc. #192) - Carmine & Orange. 30 S. (1925 - Sc. #193) - Black & Buff. 50 S. (1925 - Sc. #194) - Chocolate. 01 L. (1925 - Sc. #195) - Dull Green. 02 L. (1925 - Sc. #196) - Dark Green & Buff. 04 L. (1925 - Sc. #197) - Lake & Yellow. 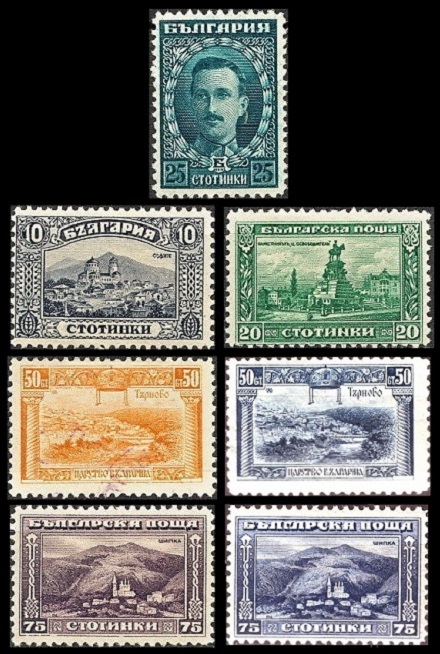 The five heraldic, pictorial, and portrait definitive Bulgarian stamps shown above were issued in 1926. Their three common designs are as follows. Cathedral of Sveta Nedelya in Sofia, after bombing. 50 S. (1926 - Sc. #198) - Gray Black. 01 L. (1926 - Sc. #199) - Gray, Green. 02 L. (1926 - Sc. #201) - Olive Brown. 06 L. (1926 - Sc. #202) - Deep Blue & Pale Lemon. 10 L. (1926 - Sc. #203) - Brown Black & Brown Orange. 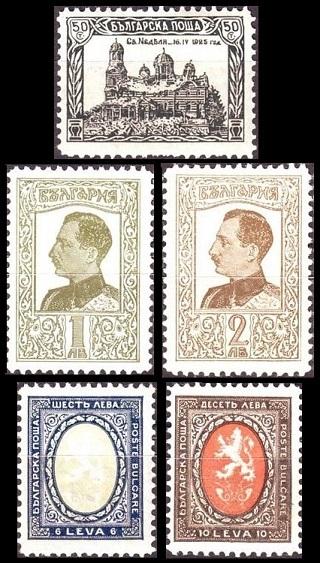 The four re-drawn Lion-of-Bulgaria-type Bulgarian stamps of 1881 shown above were issued in 1927 and 1928. 10 S. (1927 - Sc. #207) - Dark Red & Drab. 15 S. (1927 - Sc. #208) - Black & Orange. 30 S. (1928 - Sc. #209) - Dark Blue & Bister Brown. 50 S. (1928 - Sc. #210) - Black & Rose Red. The overprinted and re-valued portrait-type definitive stamp of 1911 shown above (Sc. #112) was issued on July 6, 1915. The overprinted and re-valued Lion-of-Bulgaria-type definitive stamp of 1889 shown above (Sc. #113) was issued on March 9, 1916. 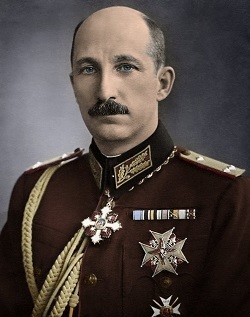 Boris Klemens Robert Maria Pius Ludwig Stanislaus Xavier of the House of Saxe-Coburg and Gotha (1894-1943) ascended to the throne as Tsar Boris III on October 3, 1918, following the abdication of his father, Tsar Ferdinand. During the 1930's, under his firm rule, Bulgaria entered a period of prosperity and growth. In 1941 though, Boris and his government made the same mistake that Tsar Ferdinand had made at the beginning of World War I. They chose the WRONG alliance, with that being the AXIS Powers. Boris tried to resist German control of his country, refusing to join Germany in their invasion of the Soviet Union. Boris also worked to prevent the deportation of Bulgarian Jews to extermination camps. For these acts of resistance, he was greatly admired by much of the Bulgarian population. On August 28, 1943, Tsar Boris III died of heart failure, and he was succeeded by his six-year-old son, who became Tsar Simeon II. Since Simeon was too young to rule, Boris' brother, Prince Kiril, was appointed as the regent.